1. Soak the rice in water. Soak the black gram dal in water separately, And let both soak for a minimum of 4 hours. 2. Thoroughly wash the black gram dal and grind adding water, Till the mixture is smooth, Light and frothy. Wash and grind the rice into a paste. 3. Mix the batter again in the morning. Mix well. The batter should be thick like cake batter. Water may be added if it is too thick. 4. 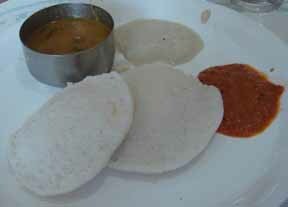 Smear idli moulds with oil, and pour the batter in each of them till they are three quarters full. Steam the idlis in a pressure cooker for about 10 minutes. Note: Do not use the weight in pressure cooker as this is used for steaming purpose only.